What is Cause and Effect Diagram? 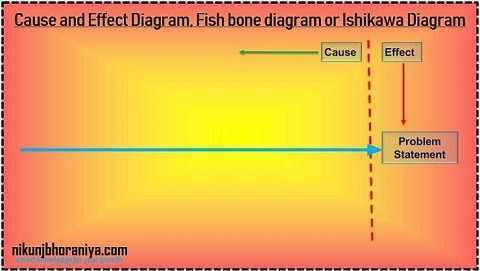 → Cause and Effect Diagram is a diagram which represents the meaningful relationship between an effect and its causes. 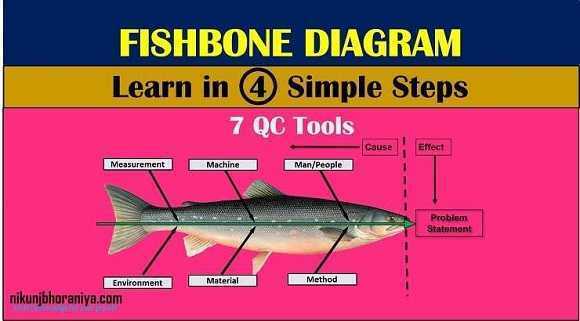 →It is a very good tool for root cause analysis and a part of 7 Basic Quality Control Tools. → Dr. Kaoru Ishikawa developed the first cause and effect diagram in 1943 while consulting for Kawasaki steelworks in Kawasaki Shipyards. 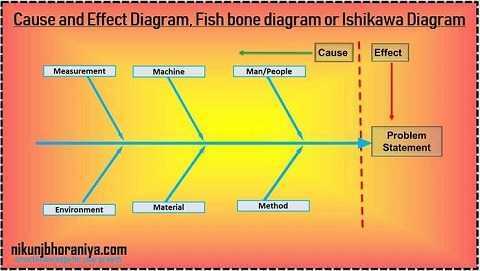 → We can easily find out a valid root cause or causes by fishbone diagram or cause and effect diagram. 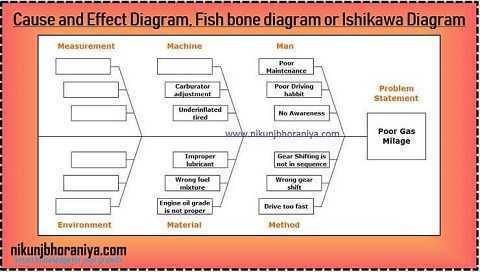 What is a Fishbone Diagram or Ishikawa Diagram? 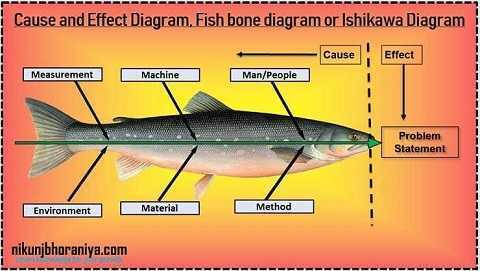 → A cause and effect diagram is called a fishbone because it looks like the bone of fish. 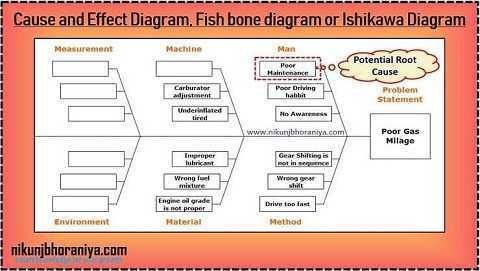 → Dr. Kaoru Ishikawa developed the first cause & effect diagram in 1943 while consulting for Kawasaki steelworks in Kawasaki Shipyards so Dr. Joseph M. Juran named it as "Ishikawa"
Identify the main cause groups. then Identify causes and sub-causes. → Define a problem statement (effect). → Write it at the center-right of the chart or whiteboard. → Draw a box around it and draw a horizontal arrow running to it. → Brainstorm the major categories of causes of the problem. → For manufacturing Industry, it is "6M"
→ For marketing Industry "6M" is replaced by "8P"
→ For Service Industry "6M" is replaced by "4S"
→ Brainstorm all the possible causes of the problem. → Ask: “Why does this happen?” As each idea is given, the facilitator writes it as a branch from the appropriate category. → Again ask “why does this happen?” about each cause. → Write sub–causes branching off the causes. → Continue to ask “Why?” and generate deeper levels of causes. → At last, you will get the Potential root cause.